I suppose it has nothing to do with Janet & Friends “wrongful” monetary policy. Maybe I´m wrong. 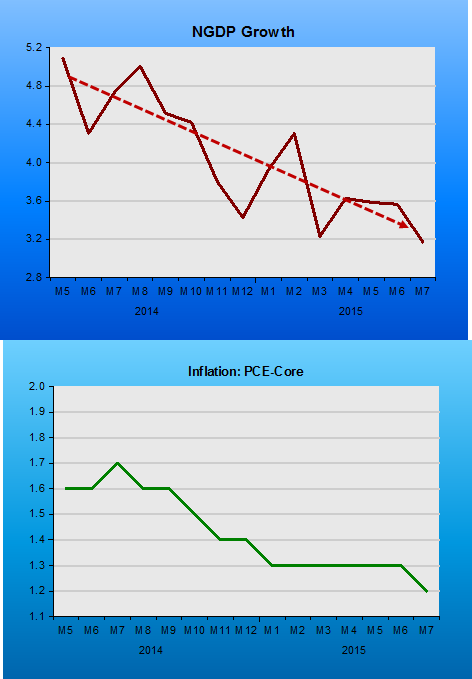 For more than one year monetary policy has been tightening, but the Fed thinks it´s highly accommodative! 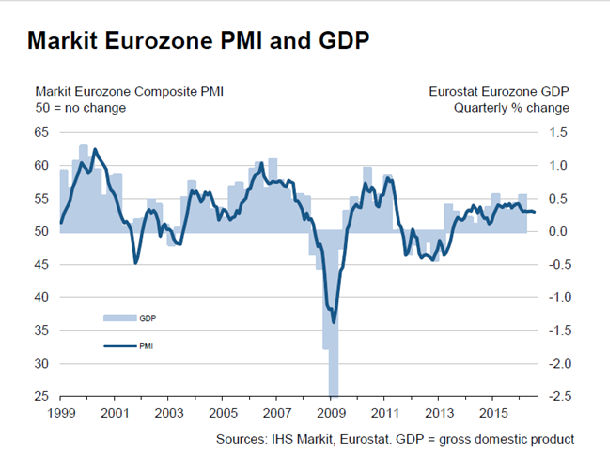 And what that model is doing is to tighten monetary policy! And those indicators of the stance of monetary confirm that the Fed is tightening the screws, with NGDP growth and inflation going down. A spillover effect of the monetary policy tightening is the appreciation of the dollar and the fall in commodity and oil prices. But the geniuses at the FOMC reason from a price change and argue that the fall in inflation is a consequence of the fall in oil prices and appreciation of the dollar, and when these effects dissipate, inflation will climb towards the 2% target! With that caliber of central bankers, no wonder things are a mess. It would be a pity if this late into the game Australia “crossed the Rubicon” and let NGDP go south of trend! The “Australia story” is interesting from the point of view of Market Monetarists because it emphasizes the crucial role of monetary policy not only in avoiding crashes but also excessive fluctuations. The focal point is that monetary policy should keep the economy evolving along an NGDP level such that nominal stability results. For some economies (US, Eurozone, Japan) that NGDP level should be the target. In the case of small open economies such as Australia, strongly dependent on commodity exports, it should adopt an Export Price Norm (EPN), which Lars Christensen characterizes as the open economy version of NGDP level targeting. EPN simply means that the central bank should peg the exchange rate to the price of the commodity. In this case, if the exchange rate moves together with the commodity price, monetary policy is “just right”. If the exchange rate moves by less than commodity prices monetary policy will be “too easy” if commodity prices are rising and “too tight” if commodity prices are falling. With those considerations in mind, we can chart the history of monetary policy in Australia since the early 2000s. [Historical note: During the Asia crisis of 1997/98, Australia escaped “scot-free” exactly because the EPN was in full play]. 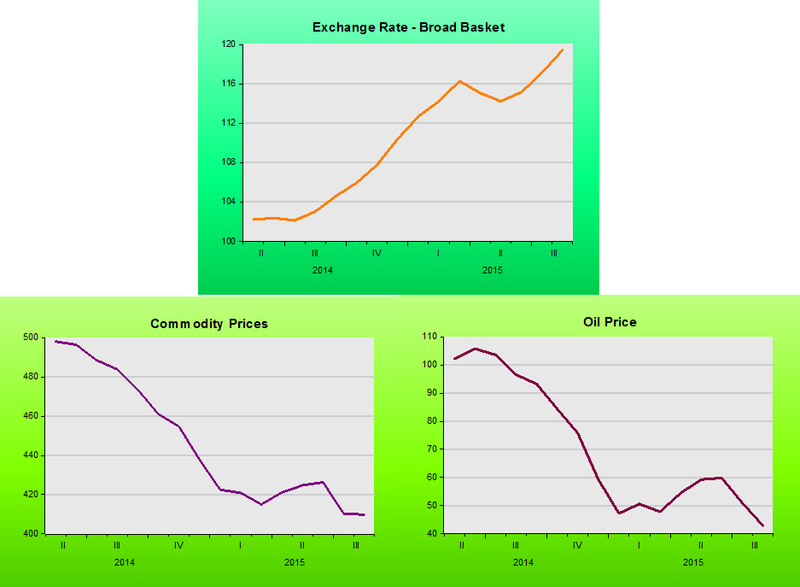 The top chart shows the A$/USD exchange rate and commodity prices. For different periods, the nature of monetary policy is characterized by comparing moves in the exchange rate with moves in commodity prices. For example, during 2004-06 monetary policy was “too easy”. While the exchange rate remained “flat”, commodity prices climbed significantly. The bottom chart shows the corresponding movements in NGDP. 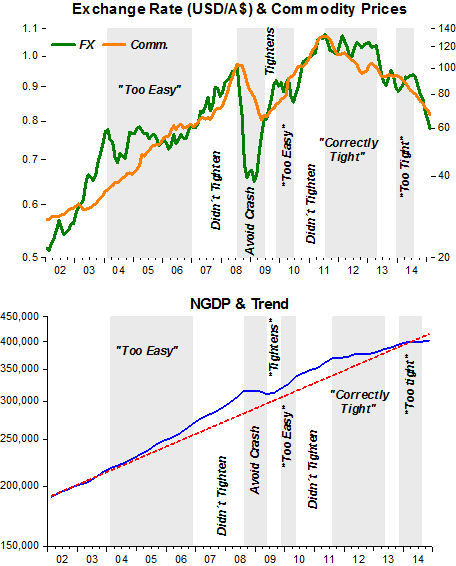 For example, in 2004-06, with monetary policy being” too easy”, NGDP began to rise above trend. When monetary policy didn´t tighten (to compensate for the previous easing), NGDP remained above trend. During the international crash, when NGDP dropped far below trend in most economies, Australia was able to ease sufficiently to avoid being “penalized”. Between the second half of 2011 and early 2013, with NGDP above trend, monetary policy tightened. 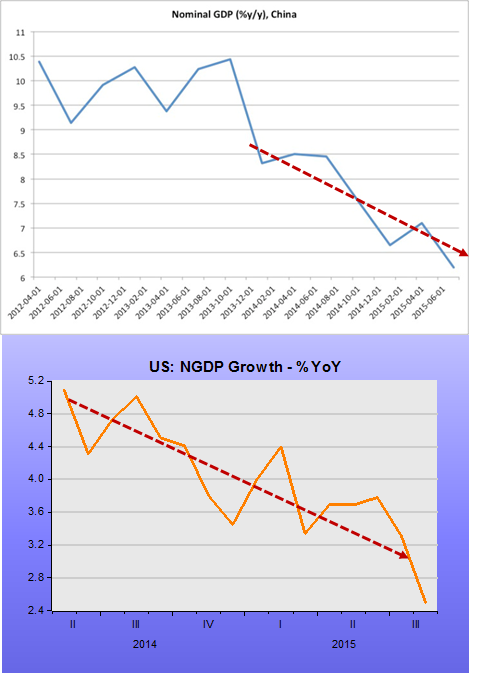 With this, NGDP remained “flat” and converged to trend. “The inflation outlook, as assessed at present, would afford scope to ease policy further, should that be necessary to support demand [“code” for NGDP],” Governor Glenn Stevens said in a statement today in Sydney after leaving the overnight cash-rate target at 3 percent. “On the other hand, the exchange rate remains higher than might have been expected, given the observed decline in export prices, and the demand for credit is low, as some households and firms continue to seek lower debt levels,” he said. Right after those comments, the exchange rate depreciates to “catch-up” with the fall in commodity prices. Unfortunately, for most of 2014, monetary policy becomes excessively tight again. Australia got infected by with the “financial stability virus”, which previously had “put Sweden to bed”. In its severest warning yet on house prices, the RBA said surging investor demand for property may cause the market to overheat and invite sudden price falls. A housing-market crash might undo a lot of the central bank’s efforts supporting a still-fragile economy trying to cope with a downturn in mining investment. Record-low interest rates were supporting the economy, but policy makers needed to be aware of the risks to future growth accompanying “a large further build-up in asset prices,” the minutes of the bank’s September 2 policy meeting said. Hopefully, the recent large drop in the exchange rate is indicative that the RBA has learned from the mistakes, and NGDP will be “carried back to trend”.